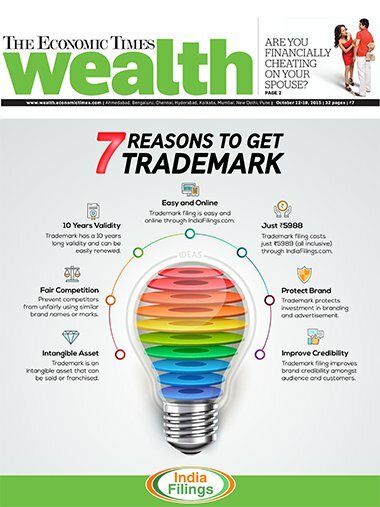 Nidhi Company is a company registered under the Companies Act, 2013, which has a sole objective of cultivating the habit of thrift and savings amongst its members. 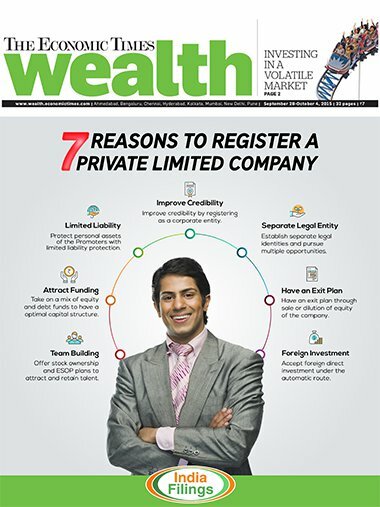 Nidhi companies are allowed to take deposit from its members and lend to its members only. Therefore, the funds contributed for a Nidhi company are only from its members (shareholders) and used only by the shareholders of the Nidhi Company. Nidhi company is a class of NBFCs and RBI is empowered to issue directions to them in matters relating to their deposit acceptance activities. However, in recognition of the fact that these Nidhis deal with their shareholder-members only, RBI has exempted the notified Nidhis from the core provisions of the RBI Act and other directions applicable to NBFCs. Therefore, Nidhi Company is an ideal entity to take deposit from and lend to a specific group of people. A Nidhi company is a legal entity and a juristic person established under the Act. 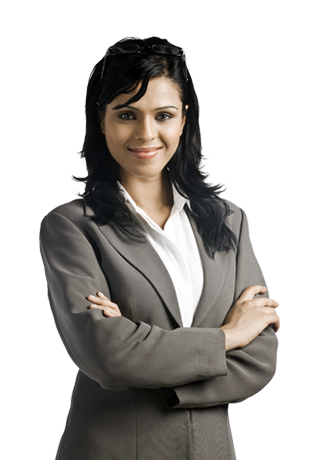 Therefore, a Nidhi company has wide legal capacity and can own property and also incur debts. The members (Directors) of a Nidhi company have no liability to the creditors of a Nidhi company. The Board of Management of a Nidhi company can be easily changed by filing simple forms with the Registrar of Companies. The Board of Management of a Nidhi company controls the activities of the Nidhi company. A Nidhi company has 'perpetual succession', that is continued or uninterrupted existence until it is legally dissolved. 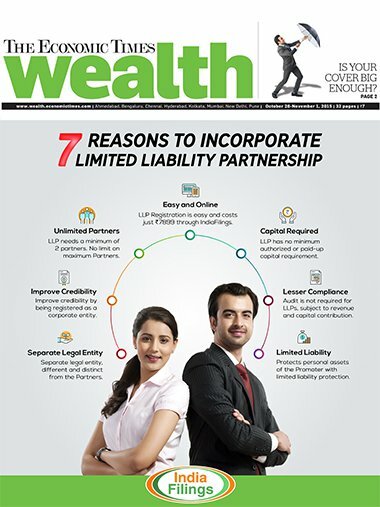 A Nidhi company, being a separate legal person, is unaffected by the death or other departure of any member but continues to be in existence irrespective of the changes in membership. 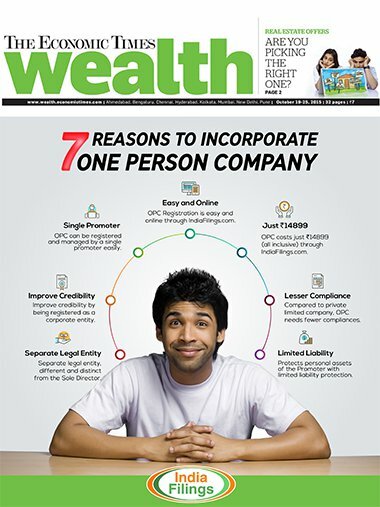 A Nidhi company enjoys better credibility when compared to Mutual Benefit Organizations. Nidhi companies are registered and monitored by the Central Government. Mutual Benefits Organization are on the other hand governed and monitored by State Governments. 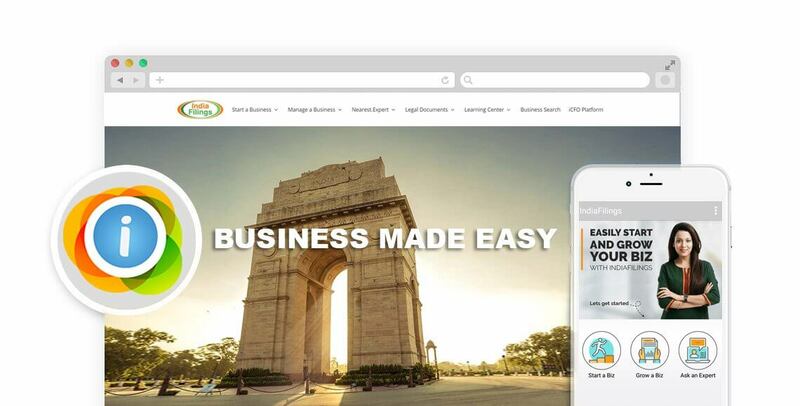 How many people are required to register a nidhi company? A minimum of 3 directors and 7 shareholders are required to register a Nidhi company in India. The Director needs to be over 18 years of age and must be a natural person. Is an office required for starting a Nidhi Company? Do I have to be present in person to incorporate a Nidhi Company? No, you will not have to be present at our office or appear at any office for the registration of a Nidhi Company. All the documents can be scanned and sent through email to our office. Some documents will also have to be couriered to our office. A Digital Signature establishes the identity of the sender or signee electronically while filing documents through the Internet. The Ministry of Corporate Affairs (MCA) mandates that the Directors sign some of the application documents using their Digital Signature. Hence, a Digital Signature is required for all Directors of a proposed Nidhi Company. Identity proof and address proof is mandatory for all the proposed Directors of the Nidhi Company. PAN Card is mandatory for Indian Nationals. In addition, the landlord of the registered office premises must provide a No Objection Certificate for having the registered office in his/her premises and must submit his/her identity proof and address proof. How long will it take to incorporate a Nidhi Company? 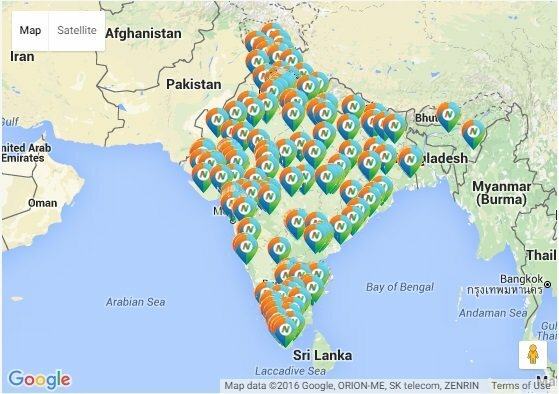 IndiaFilings.com can incorporate a Nidhi Company for in 20-30 days. The time taken for registration will depend on submission of relevant documents by the client and speed of Government Approvals. 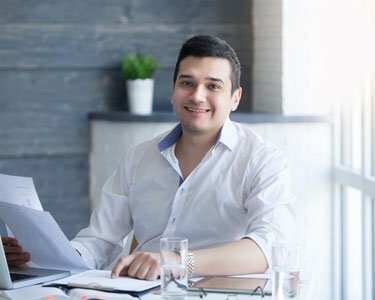 To ensure speedy registration, please choose a unique name for your Company and ensure you have all the required documents prior to starting the registration process. Once a Nidhi Company is incorporated, it will be active and in-existence as long as the annual compliances are met with regularly. A Nidhi Company must have a minimum of 200 shareholders and comply with other criteria within one year of incorporation. In case, annual compliances are not complied with, the Nidhi Company will be asked to refund the deposits. Nidhi company registration including 8 DSC, 3 DIN, 1 RUN Name Approval, PAN, TAN, Company Kit and LEDGERS accounting software. Inclusive of government fees and taxes. 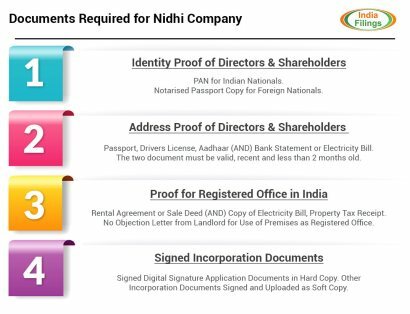 Nidhi company registration including 8 DSC, 3 DIN, 1 RUN Name Approval, PAN, TAN, Share Certificates, Share Allotment for upto 200 shareholders, Company Kit and LEDGERS accounting software. Inclusive of government fees and taxes. 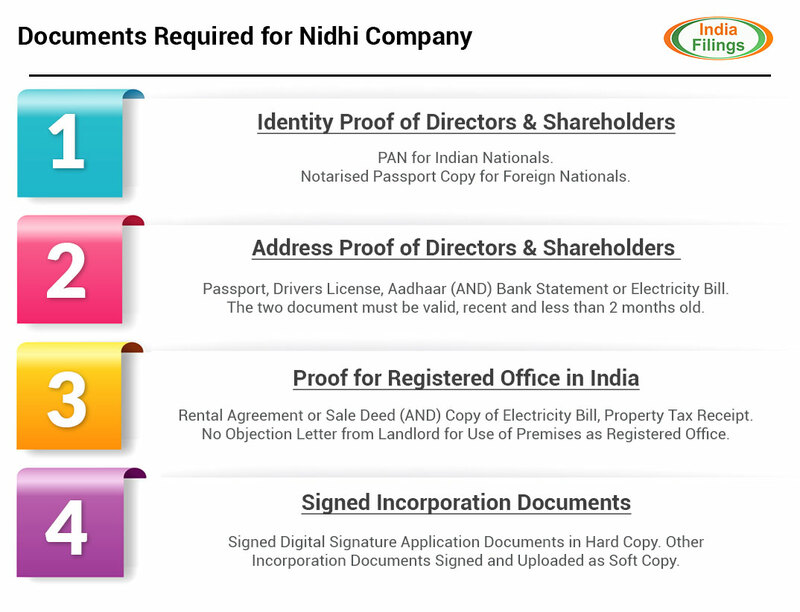 Nidhi company registration including 8 DSC, 3 DIN, name approval, PAN, TAN, Share Certificates, Share Allotment for upto 200 shareholders, Company Kit, Trademark Filing and LEDGERS accounting software. Inclusive of government fees and taxes. IndiaFilings.com can register a Nidhi Company in 20 to 30 days, subject to ROC processing time. Digital Signature Certificate(DSC) and Director Identification Number(DIN) is required for the proposed Directors of the Nidhi Company. DIN and DSC can be obtained for the proposed Directors within 5 to 7 days. Once DIN and DSC are available for atleast three Directors, application for reservation of name for Nidhi company can be made to MCA. Name approval can be obtained in 3 to 5 working days.